Anihan Technical School graduate, Imie Lileth Burgos is from Bayuin, Socorro, Oriental Mindoro. She is the Pastry Chef of Wildflour Café & Bakery in Podium, Ortigas. She did her On-the-Job-Training in Taal Vista in Tagaytay. 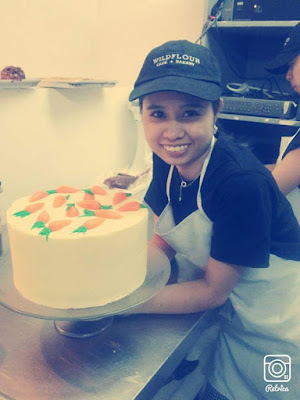 After graduation, she wanted to experience working in Manila, so she was applied in Wildflour in the pastry department. She was mostly with some of her classmates working there. Time passed and her classmates were moved to the other branches of the same department. She ended up heading the pastry department in Podium. Imie has ten siblings. She is the youngest of the brood. It is already understood among her siblings that they will help their parents in whatever financial needs they would incur. Being the youngest, Imie also wanted to do her part. She went to Anihan for the courses it offered and the scholarship. She continues to support her parents, her father being a farmer in Mindoro and her mother is a plain housewife. Some of her siblings are staying in Mindoro. Imie helps them who would need financial assistance now and then.